Dragon Tail Bowie with Stand | BUDK.com - Knives & Swords At The Lowest Prices! This fantasy Bowie is so detailed you'll actually feel you hold the awesome power of a dragon's tail in your hand! 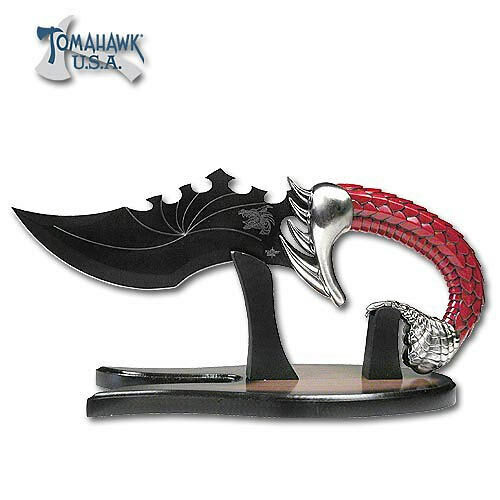 This collectible item features a wickedly designed 7 1/2" black stainless steel blade with grooved pattern design. The cast metal handle offers a spiked guard and a clawed pommel that highlight the look of this piece and give solid protection to the hand. The ruby red composite grip is constructed to duplicate the look and feel of scales. This fantasy piece measures 13 1/2" overall and includes a wood display stand. Tomahawk, XL1259.